"The late Rev. Lewis McComb, of Bates county, will long be remembered as the pioneer Baptist minister of this county, who was universally loved and esteemed by all who knew him. He was born in Knox county, Tennessee, May 27, 1821, and was a son of William McComb, who removed from Tennessee to Sangamon county, Illinois in 1827. William McComb was father of ten children. He died in Illinois in 1835. (Other records say 1837 and Missouri) Two years later, his widow removed with her family of children to Miller county, Missouri. Lewis McComb was there married to Sarah Vann in 1840. In 1845 he located in Johnson county and in 1848 made a settlement in Van Buren (now Bates county). Soon after his arrival in this county in August, 1848, he entered government land and also bought adjoining land which he developed and became owner of several hundred acres. As a farmer and stockman he was quite successful. He resided in Spruce township for many years and became well-to-do. His dwelling house was erected upon land which practically stood in three counties, but was never moved. When the McComb residence was built, the land was located in Van Buren county. After the territory was re-districted, it was called Cass and Vernon counties, and later, Bates county was formed and thus remained through the Civil War period. The McComb residence was built in 1853 and it was occupied by its builders and the members of his family until 1905, with the exception of two years of the Civil War when (Ewing's) Order Number Eleven was issued. In 1905 a new dwelling was erected upon the McComb farm. When Lewis McComb settled in Spruce township, his nearest neighbor was Mr. Embree on Elk Fork, almost five miles away. Deer and wild turkey were plentiful and he killed them in large numbers in his own dooryard when in need of fresh meat for the family larder. Reverend McComb lived to see a wilderness developed into a thickly populated and prosperous country and took a very active part in its up-building. Soon after Lewis McComb came to Bates county, he was joined by his three brothers, Jacob, John (S.), and (Dr.) James, and a sister, Elizabeth. Jacob McComb bought a farm adjoining that of his brother Lewis and lived thereon until the outbreak of the Civil War, when he enlisted in the Confederate army. John McComb opened the first store in the town, in 1855, the store being operated under the firm name of McComb & Robinson. This store was conducted until the outbreak of the Civil War, when John McComb joined the Southern army and was elected captain of a company of men recruited in Bates county. Capt. John McComb led the charge upon the Federal stronghold at Lone Jack. While making the charge at the head of his men, just as he had climbed atop the fence surrounding the Federal stronghold, he was shot in the left breast, the bullet passing through the lung and body. He fell into the arms of one of his own men and told him to lay him down and to go on with the charge. When the battle was over his brother, Lewis, was notified and immediately went to his brother's assistance at the risk of his own life, remaining with the wounded soldier until his death on the following Sunday night. The wounded captain was taken to a room occupied by nineteen other sufferers and his brother, Lewis, was the only attendant. The room was poorly lighted by a grease lamp and about all that could be done for the wounded men, was to change their uncomfortable positions occasionally and give them water to drink, while all the time one was compelled to listen to their shrieks of pain and dying moans. Three men died on that night. The battle of Lone Jack was fought on Friday morning (15 August 1862) and John McComb died the Sunday following his mortal wound (17 August 1862). His brother Lewis remained with him until he died and was buried and then made his way home, successfully evading several Union scouting parties on his homeward way. James McComb came to Bates county in 1853, and taught two terms of school. In the spring of 1854 he farmed with Lewis McComb, and taught school in Henry county. In 1855 he and his brother, John, opened a store in Butler, and in November of 1856, he left Butler to become a student at the State University in Columbia. In the fall of 1857 he entered the St. Louis Medical College, and in 1858, he began the practice of medicine near Lebanon in La Clede [sic] county. Dr. McComb graduated from the Jefferson Medical College, Philadelphia, Pennsylvania, and then located permanently in Lebanon, where he has ever since been engaged in the practice of his profession. He is the only surviving member of his father's family at this date. Elizabeth McComb became the wife of (Napolean Bonaparte) Bowen Coleman, a member of a prominent pioneer family of Bates county. She died soon after her marriage, leaving one child, (Susan) Ella (24 Dec. 1859-17 Jan 1930), now the wife of S. B. Kash (21 Jan. 1860-?) of Deepwater township (married 1883). The marriage of Rev. Lewis McComb and Sarah Vann was consummated in 1845. Five children were born to this marriage, namely: J. D., Porum, Oklahoma; Dr. Lewis L., Norman, Oklahoma; William, died at the age of twenty-four, Lawrence, Kansas; Mary J.; and one other, deceased. Mrs. Mary (Vann) McComb (Sarah "Sallie") died in 1855. Lewis and Sarah McComb were listed as "old members" of the Providence Baptist church, 11 mi. South and 1 1/2 miles West of Warrensburg, in the "History of Johnson Co., MO," K.C. Hist. Co., 1881, p. 591. Sometime after the death of his first wife, he married in 1857 Annie E. Cooper, who died six months later. 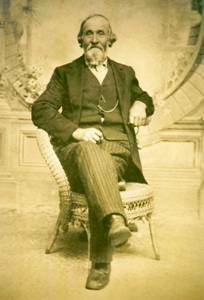 In 1859, he married Mary Jane Radford, who bore him children as follows: John L., Norman, Oklahoma; Mrs. Amy E. Malsbee, deceased; Mrs. Sarah L. Rogers, Spruce, Missouri; Finis, deceased; Charles A. McComb, Butler, Missouri; Walter Q., Spruce, Missouri; Mrs. Mary J. McElwain (Mollie), Nevada, Missouri. Mrs. Mary J. (Radford) McComb died October 6, 1882. He was widely known as the "Marrying Parson," the "St. Louis Republic" at one time referring to him in this sense, and stating that he had married more couples than any man in the state of Missouri during the course of his ministerial career. Rev. Lewis McComb sold his farm to his son, Charles A. McComb, in 1897 but continued to make his home on the place until his death, February 26, 1907. His death marked the passing of one of the best loved and most useful personages of the pioneer era of Bates county. He endured many hardships in the pioneer days of the settlement and development of western Missouri, but maintained a cheerful disposition through adversity and sorrow and lived to see peace and plenty mingled with happiness and contentment take the place of the old, troublesome days on the plains of Bates and adjoining counties. He spent the major part of his long life as a pioneer Baptist missionary in western Missouri and eastern Kansas and assisted in establishing many Baptist churches in this section. He resided upon his farm in Bates county continually until his death with the exception of two years spent in Morgan and Miller counties from 1863 to the close of the Civil War in accordance with the requirements of General Ewing's Order Number Eleven. Reverend McComb donated the land for the church and cemetery located in Spruce township upon his farm and was a large factor in the building of the church edifice thereon. Both he and his wife are sleeping the long sleep of the just and godly in the plat of ground which he set aside for the community burial place may years ago. Alongside with them are sleeping children and relatives who have departed from this earthly realm. History will give Rev. Lewis McComb an enviable place in the annals of Bates county and western Missouri for the great work he accomplished and the unselfish and whole hearted devotion with which he ministered to the souls and bodies of the people in Bates county. No task was ever too great for him if by doing it he could benefit some one of his fellow men; no sacrifice was too great for him to make if he could save a soul and win a convert to Christianity and his converts numbered into the hundreds and thousands during his long and devoted ministerial career."